There's a monster in the story shaped like a scary cruise ship. 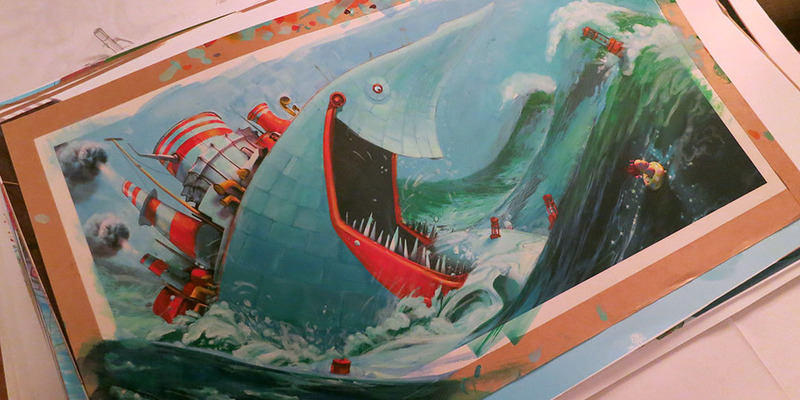 My 5 year-old nephew calls it "el barco monstro". I think he's scared of it but I also think it's his favorite page. The original idea was to have something fantastical emerging from the pool... I had the thought of a cruise ship, something like the Titanic... When I sketched it out, the ship took on a life of its own. I gave it eyes, a gaping mouth and a menacing smile, and after that the story went off in an unpredictable new direction. Here's some of the CG modeling that went into it. 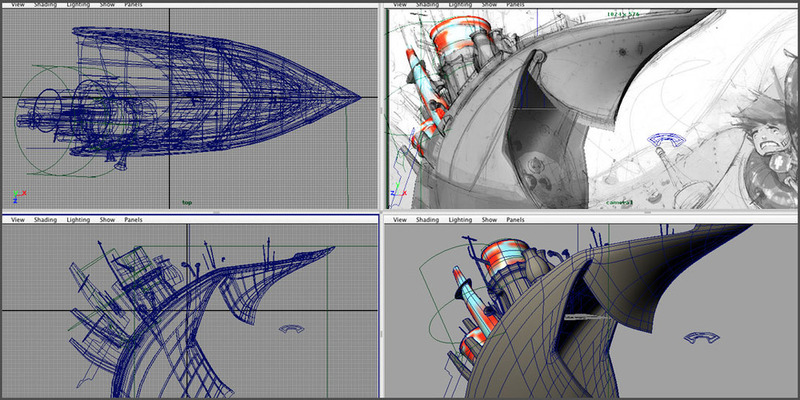 A friend helped me with basic curved hull of the ship (thanks Mike!). Then I went in an pushed and pulled the CG model using 3D lattices, forming it to the shape I wanted while using the original sketch as an overlay guide. You can see the sketch overlay on the top right quadrant. After the CG modeling is done, I have the image printed out and it becomes the underpainting to the illustration. Above and below are the two raw paintings that were later comped together into a final illustration along with other elements like balloons. At the time I thought PHEW! All this was a bit of overkill for one illustration, but the results were a cool combination of newfangled CG and traditional paint and I moved forward with this technique for other illustrations in the book.